It’s a merry old time over at Blizzard HQ as not only has Hearthstone’s latest set been released but there are now 50 million registered players for the game. That’s slightly more than the population of South Korea, and indicates roughly 60,000 new users every single day since the game was first publically playable in January 2014. Mightily impressive, even if some number are individuals with accounts in multiple regions. This news comes along with Whispers of the Old Gods releasing worldwide, introducing a new way to play in the Standard format and a significant shake-up of the metagame. See all the new Hearthstone cards right here. 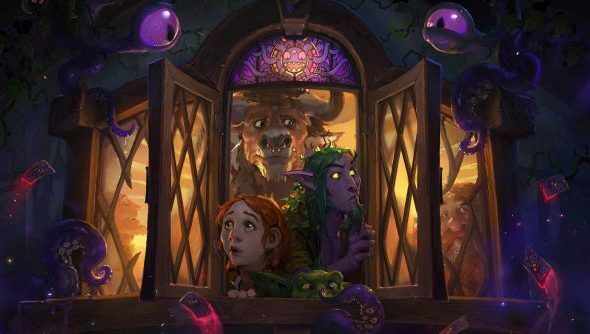 That shake-up has proved popular with Twitch viewers, where Hearthstone has been locked to the top of the by-game listings since yesterday. Streamer Octavian “Kripparrian” Moroșan, the game’s most recognisable personality, managed to hit a concurrent viewer number of over 114,000 while opening packs yesterday. It’s not quite a record for a personal stream, but it’s far higher than we’ve seen recently, and well over the 30k that Hearthstone streams usually max out at. It’s unlikely to represent a takeover of the usual League of Legends top-spot, but it’s looking like a less unassailable position than normal. As for the player count, it’s fairly low in comparison to many of its peers – World of Warcraft has 100 million registered accounts, League of Legends had over 70 million actually playing every day in 2014 and while Dota 2 is hard to judge, SteamSpy puts it at about 60 million. However, when you factor in the timelines, and that you’re talking about some of the most popular games in the world here, it’s still hugely impressive. Obviously it’s difficult to translate these numbers into actual regular playtime, but if you’re top of Twitch, growing regularly and profitable – things’re going well. We’ll have more on Hearthstone and its new expansion very soon as we bring you what you should be playing in the new world. In the mean-time, how are the nerfs, new cards and new format treating you?